- Measurement of acoustic parameters and evaluation of listening spaces and public performance venues. 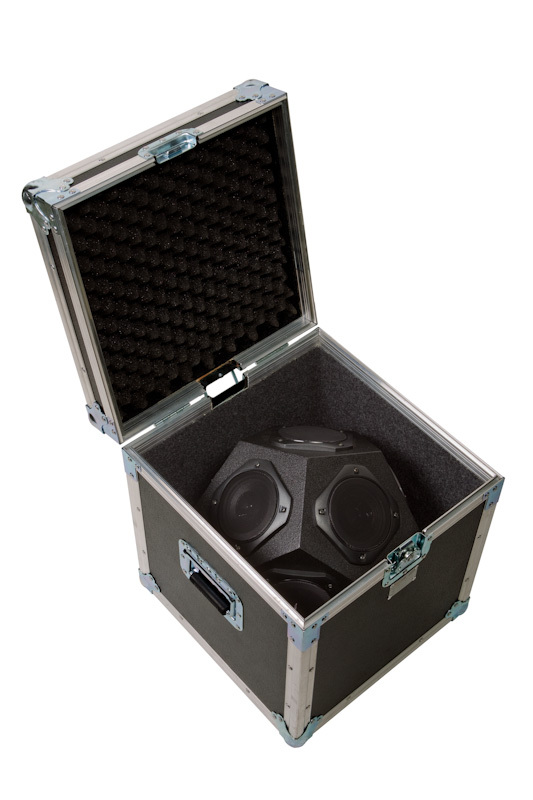 The Peecker Sound JA12 dodecahedron sound source is designed to have omni-directional emission and therefore complies with the UNI EN ISO 140-3:2006 and UNI EN ISO 3382:2001 standards. Its typical application is in measuring parameters for architectural acoustics: soundproofing, acoustic absorption, measurement of reverberation time, of the pulse response and of the acoustic parameters of performance venues. The speaker complies with the passive acoustic requirements for buildings (Italian D.P.C.M. 5/12/1997) and makes it possible to deliver a full 122 dB of continuous acoustic power. The dedicated JADSP1250 amplifier can supply up to 1250+1250 W of power into the JA12 impedance and has a pink noise generator that can be remotely activated using an remote control. “The JA12 dodecahedron speaker is the perfect omni-directional sound source for all skilled sound engineers who use it to measure room acoustic parameters, to verify compliance with passive acoustic requirements for buildings and to take sound insulation measurements. It is the ideal tool for configuring a measurement chain that complies with UNI EN ISO standards". The Peecker Sound JADSP1250 unit consists of a white and pink noise generator plus a 1250+1250 W class D digital power amplifier. The system allows the use of just the generator or just the amplifier, thanks to the balanced output of the internal generator and the balanced input of the amplifier. Should just the amplifier be used, the employment of an external noise generator is required (digital audio signal originating from Notebook). Thanks to this configuration it is also possible to introduce additional signal processing devices between the internal generator and amplifier, such as equalizers or compressors. The class D amplifier is equipped with an internal limiter which prevents any possible overloading above the loudspeaker system RMS power tolerance level. The presence of this limiter and uncompromising power availability allow the Peecker Sound JA12 source speakers to be used to their full potential, ensuring accurate reproduction of generated peaks (high crest factor) as well as protection against heat damage caused by RMS overloads, which can occur if there are external signals with low crest factors (as when using a sine sweep signal, for example). Thanks to the class D-type amplifier, the unit is lightweight and portable as a result. “JADSP1250 digital power amplifier and JAGR01 portable white and pink noise generator are two unavoidable devices for professionals of Architectonic Acoustics. Both of them include in one device a high power and the capability to make several operations; the lot with a very short weight and, as a result, a portability in compliance with the one requested by this typology of products". Peecker Sound is a registered trademark property of Sound Corporation. Sound Corporation. ©2019 Sound Corporation group.